Our mandala designs have become exceptionally popular. They accent existing tattoos well, and are great choices for those who don't want to tout a particular fandom while still looking awesome. This design was partially inspired by a clock face, and I really like the symmetry of it. It goes well anywhere! Approximately 4.5" at widest point. Expect your tattoo to last 4-10 days, depending on care. All items are handcrafted to order, and ship within 3 business days. First Class shipping takes an additional 2-5 business days. Expedited shipping methods are available at checkout. 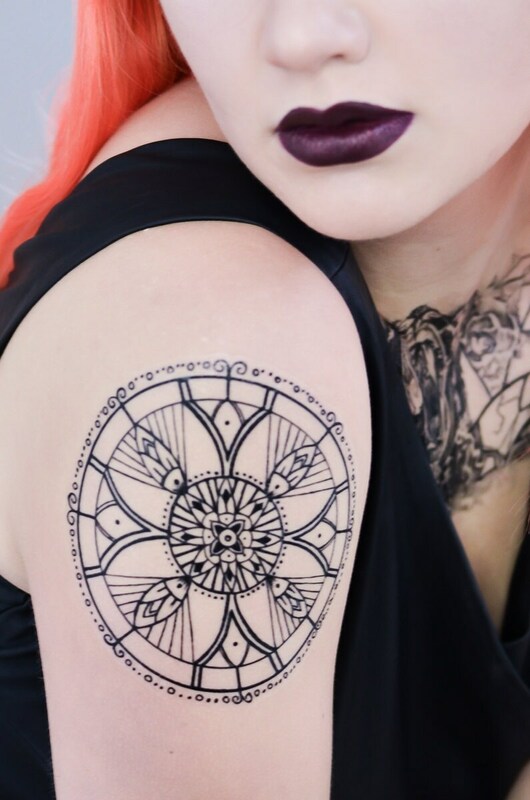 Ideal application requires a moisturizing lotion and translucent cosmetic powder to matte out the tattoo. Full instructions and tips are located in the FAQ. The adhesive manufacturer advises that you not use this product if you are pregnant or breast feeding. For external use only. Do not apply near the eyes, mouth, or sensitive areas. However, simple graphic or text-based designs are possible! Message me if you're interested. Check your tattoo for bubbles that may have formed during shipping. If any are present, press them out. Pick a location. Shave first. Wash and dry your hands and skin. Remove the plastic backing slowly from your tattoo. Don’t touch the adhesive. Take your time. Line up your tattoo (carefully!) and press it firmly against your skin. When the paper is fully saturated, lift a corner of the paper and roll it back against the design. Let it dry for a few moments. Apply translucent cosmetic powder lightly with a soft brush or puff to your tattoo. This will help matte out the design and add realism. Buy a backup. At worst you have to remove an "oops" and try again. At best, you have a spare for a later date! Designs last longest on shins and inside forearms. They do not last long on hands, fingers, shoulders or necks. Don't use baby powder if you don't want chalky ink. Anti-chafing powder gel is awesome. Straps and sweat are your tattoos' worst enemies. perforate the tattoo, and/or wick the moisture out by hand. The tattoos are water-resistant, but avoid exposure to heat and moisture. Washing daily with mild soap before powdering is recommended. Always let your tattoo air dry. 1) A high-percentage Isopropyl Rubbing Alcohol and cotton balls. 2) Coconut Oil. Apply generously, wait 5 minutes, and rub gently. 3) Baby Oil. Apply generously, wait 5 minutes, and rub gently. 4) Medical adhesive remover can be purchased at some drug stores and online. It works quickly and gently. May I ink these designs permanently? I consider this request a highest compliment! 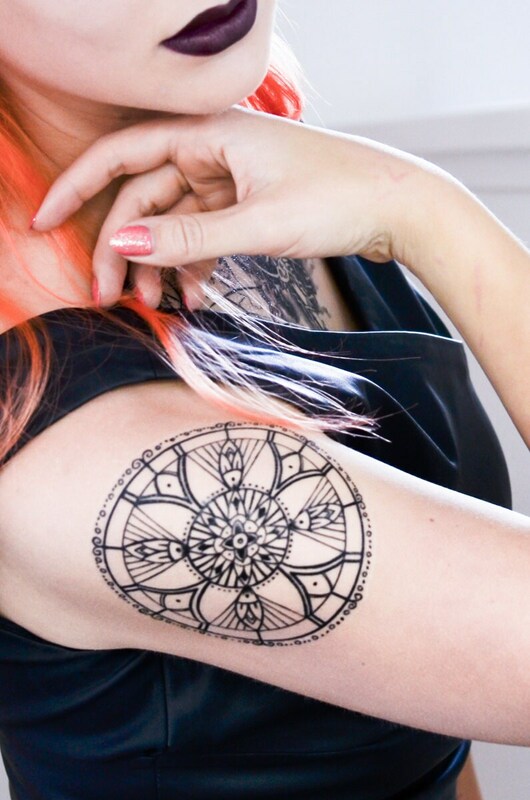 After purchase, Seventh Skin prints and temporary tattoos may ABSOLUTELY be taken to a tattoo artist if you would like to have a design inked permanently. Please send me photos of the finished piece so I may brag about it forever. Do not leave my artwork with the artist to tattoo on other clients, please. All original artwork by Britt Gorman is not to be copied, sold, or distributed. The adhesive material on these tattoos has been tested by the manufacturer to be medical grade, latex-free, and hypoallergenic, however, use at your own risk. The ink is non-toxic on the skin, but toxic if ingested. The ink is not PPD-free. Seventh Skin highly recommends that you first use the small sample tattoo in your order to test for any adverse skin conditions. If any redness or discomfort occurs, remove immediately. Call your doctor if necessary. No skin complaints have yet been reported to us, but please contact us if any occur.